Three add-on packs are planned for this year. 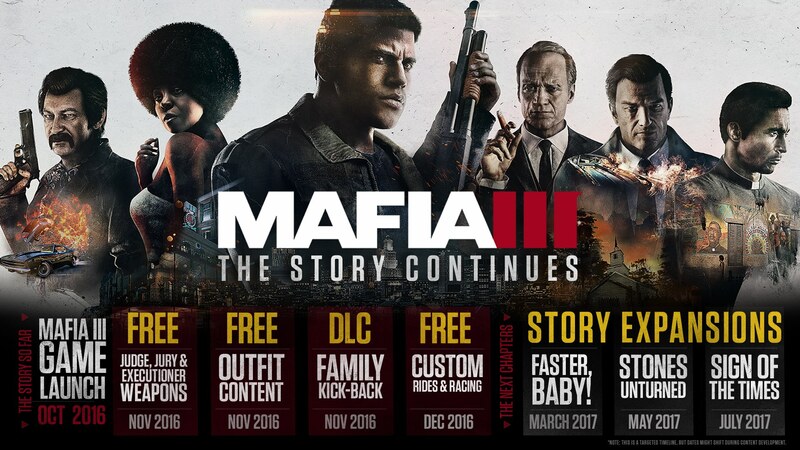 It's more than a little weird that it's taken until now for the folks behind last year's Mafia 3 to announce add-on packs for the game. But that's just how the world works lately. The additional story missions start with "Faster, Baby!" at the end of March. The expansion focuses on stunt driving and car chases, according to the game's blog. More than that, it offers up a new section of the New Orleans-esque setting. "Stunt driving takes center stage as [returning protagonist] Lincoln joins forces with Roxy Laveau, a sister-in-arms out to take down a corrupt sheriff terrorizing civil rights activists on the outskirts of New Bordeaux," the post reads. Then there's "Stones Unturned" and "Sign of the Times," which will release this May and July, respectively. You'll join forces with a CIA agent to settle a score that started in Vietnam in the former, and explore a ritualistic killing and the cult responsible in the latter. All era appropriate stuff. Given the bayou region's rich history and gothic underpinnings (True Detective season one anyone?) these expansions could be worth checking out. Hopefully the game's bugs didn't turn you off enough to trade it in already. Otherwise, there's always the excellent Resident Evil 7 if you need a virtual Louisiana vacation.